Solid brass d rings made of superior quality real brass raw materials. Available in various designs & sizes. Customized designs are most welcome. No development charges required on MOQ of 500 pcs. With the help of our modern manufacturing facilities, we produce premium quality D And O Rings. These are made with qualitative rubber polymers including neoprene, viton, nitrile and silicone. Our rubber o rings are widely demanded in oil industry. 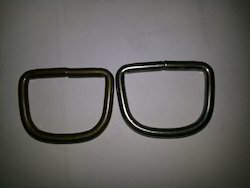 Application: D' Rings are Used in Various Industries Like Bag, Garment, Leather etc. Available Finishing: Nickel, Brass, Natural, Black, etc. 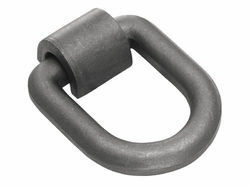 We Offer a wide array of high quality D- Rings to the valued customers, as per their requirements. We process these rings by using superior grade raw material. G. T. Cargo Fittings India Pvt. Ltd.
As a quality driven enterprise, we are engaged in providing a high quality range of D Shaped Ring. Our client can avail high quality Pet Belt D Rings & Buckles. These are made for various application as bags, belts, pet belts, apparels, webbings, aprons etc. These fittings are made with selected material duly tested, machine made product gives excellent size accuracy. These are also done in most modern machines and electroplating plant. We manufacture and supply to our clients a premium quality assortment of D rings that are ideal to be fitted in trucks and other vehicles. These sturdy D rings are widely acclaimed by our clientele because of its quality certifications and value added prices. Wire D-rings offered by us are used on loops of bags for augmenting their comprehensive look. These are fabricated using metal or brass wires that make them high reliable and durable. Further, these are available in various sizes to meet the requirement of the clients. Stainless Steel Double Dee Ring.